Number of years with EEE: This will be my second year dancing with EEE. Besides dancing with EEE I am the theater director at Mahtomedi High School. I also do choreography for several local high schools and theaters. I run a small business teaching dance to mostly first time dancers. I volunteer at the Women's Environmental Institute and Foxtail Farms. My husband, Eric, and I are in the process of starting an organic farm. What do you love about being an EEE dancer? I love dancing with EEE because of the amazing people who are part of this group. They are inspiring, uplifting and kind. I am challenged in a way that makes me a better dancer. Karis nurtures this company like a family and this really provides a comfortable space to try new things, work hard, and develop as a dancer and person. On top of this I get to do jazz! I love jazz because the music gets inside me and I can't help but want to groove. It feels so good! As a dancer, what's something you're learning right now/ something that's inspiring you? Right now as a dancer I am learning to approach movement in pieces. I often times see a phrase and get so overwhelmed by the movement I start to doubt I will be able to accomplish it. I'm trying to be more gentle with myself and accept my learning process. Coming back to jazz has helped me do this. There are so many complex layers to this style and sometimes all you can do is approach one layer at a time. I love animals...I have three cats and a dog. I also love cooking, being outside, and decorating. Tis the season to give thanks and Eclectic Edge Ensemble has many things to be thankful for this year! First of all, we are truly thankful for our supporters! Cheers to those that have been a part of our audience during the past 12 seasons! Thank you for supporting us by coming to our shows and by helping us raise funds. We are also very grateful for our board members who help guide the vision of our company- thank you for your continued time, support, and wisdom! Secondly, we are thankful for our dancers and collaborators, our tech and design staff, as well as our rehearsal space! Without these elements we wouldn't be able to continue the work we do. 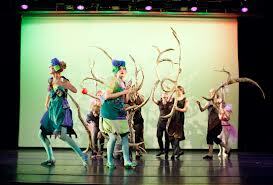 Eclectic Edge Ensemble is a family of dancers and musicians that create, imagine, and restage dance pieces. We couldn't do anything without the people involved and we are grateful for their creativity, artistry, and expertise! Snowbound! A Journey from Fall to Spring, in collaboration with MadMunchkin Productions! Karla Grotting began dancing in her mother’s basement studio, as soon as she could walk. Her mother, Kay Larson, taught tap, ballet, jazz, acrobatics, ballroom and baton, instilling an early love of movement and music. By 1974, Karla found her way to the Zoe Sealy Dance Center where she fell in love with jazz dance, and eventually began working with the Minnesota Jazz Dance Company in 1979. In her time at MJDC, she performed in works by Zoe Sealy, Maria Cheng, David Voss, Clarence Teeters, William Harren, Paulette Cousins, Kerry Casserly, Lea Darwin and others. In 1987, Karla moved to NYC to join JAZZDANCE by Danny Buraczeski and danced in both his New York and Minneapolis companies, which deepened her love for jazz dance, jazz music and its history. Karla is a founding member, principal dancer and associate director with Joe Chvala and the Flying Foot Forum, with whom she’s been dancing, touring and creating since 1990. Karla graduated from the U of MN-Twin Cities with a BA in Theater and a BFA in Dance, where she continues an adjunct faculty member. Karla enjoyed the past year as a visiting guest artist at St Olaf College and will return to visit again in the spring of 2016. Her awards include the U of M Student’s Choice Award for Outstanding Teacher in the College of Liberal Arts, a 2007 McKnight Artist Fellowship for Dancers and a 2010 Sage Nomination for Outstanding Educator and a 2015 Sage Award for Outstanding Performance for her show, Lost Voices in Jazz: The Choreographers of the MN Jazz Dance Company. 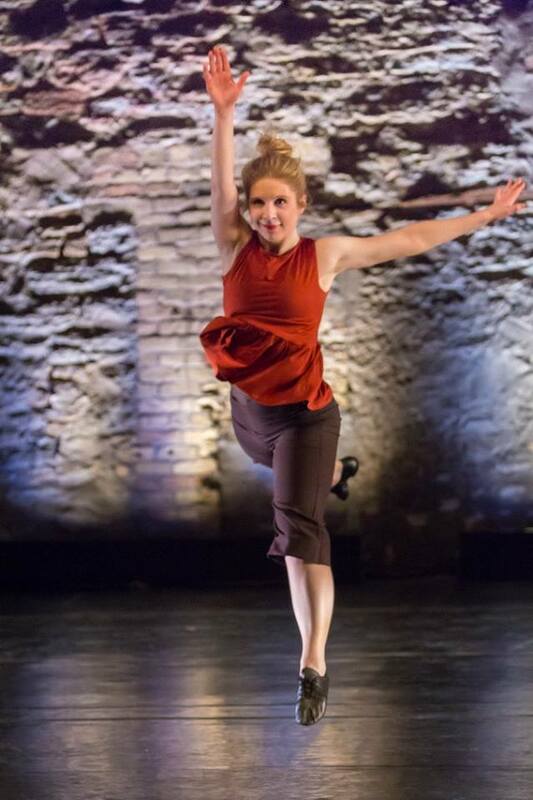 Karla creates her own dance works which blend the unique styles of her tap, jazz, modern and percussive dance experiences and has set original works on the FFF, St Olaf College, The Eclectic Edge Ensemble, SPCPA, Gustavus Adolphus College, Macalester College and others. EEE's Lost Voices Lecture Fundraiser! Get deeper into the research behind the Lost Voices in Jazz: The Choreographers of the MN Jazz Dance Company, which featured the history of Zoe Sealy and the MN Jazz Dance Company and reconstructed works by their four choreographers lost to AIDS; William Harren, Jeffrey Mildenstein, Clarence Teeters and David Voss. Lost Voices in Jazz Lecture! Check out these tunes from Karis’ Jazz Class Playlist! Like what you hear? Join us for company class! I love the rhythmic challenges that come with being a jazz dancer, it helps me connect and hear the music in ways I didn't think possible. But within that I also love the freedom to play and push the connection to the music, and Karis does a really great job utilizing both of those skills. What I truly love about being an EEE dancer is the family that Karis has created. We come together because of our passion for dance and performance and through that I feel like I have life long friends! Something that's inspiring me now, or that I'm working on personally, is to go into the rehearsal process with ease. Ease is a word that keeps me grounded and helps me keep an open mind as we work to develop new ideas. It also helps me realize that as I become an older, more mature dancer, to take movement risks/challenges with ease. Plus that word inspires me to keep the rehearsal process light and fun! Welcome to the new Eclectic Edge Ensemble website and our brand new blog. We have bold goals in writing weekly updates on events, productions, research and our process. Please stop by often to read about what’s current and coming up for EEE! I have been very fortunate to direct and manage Eclectic Edge Ensemble. Since I was young, I have always wanted to have my own dance company that produced work in both concert dance form and theatrical movement based productions. I started producing my choreography while I was working on my undergrad at the University of MN. The summer after my freshman year I produced my first show at the Saint Paul Student Center and I was hooked. Since then I have been creating and producing work consistently every year. We are coming off of an amazing season that culminated in partnering with Karla Grotting on “Lost Voices in Jazz Dance.” What an incredible production that challenged, broadened, exposed and enriched all of our lives as we studied and reconstructed the amazing works of Clarence Teeters, David Voss, Jeffrey Mildenstein and William Harren. Recently, Eclectic Edge Ensemble was honored as the 2015 SAGE honoree for Outstanding Performance for Lost Voices in Jazz Dance! We are tickled! This week we returned back to rehearsals. EEE typically takes August and September off to rest, recoup and start planning for the following season. This year is going to be jam packed with the return of Snowbound at The Lab Theater in March and culminates at the Southern Theatre July 21st-24th, 2016 as a Guest Resident in the Southern Theater’s ArtShare Program! We have FOUR new wonderful additions to our group. Pedro, Michelle, Haley and Emily have joined EEE’s Apprenticeship Program and were thrown in to a full day of rehearsal and did a fabulous job. The two pieces we started this week are from Snowbound! Celebrating the 5th Anniversary since its creation EEE and Mad Munchkin Productions are bringing back Snowbound! A Journey from Autumn to Spring at The Lab Theater March 18th-20th, 2016. Snowbound! is an infusion of puppetry and dance. Our human experience of winter is interpreted through forms from the natural world as the performance journeys from fall to spring. We started reconstructing Blacklight Ballet and Melting this week (now I am sure you are really curious to check out more!) It felt great getting these two pieces back in the studio! As the choreographer, I'm making the decisions on what to keep and what to completely change. What can this new group of dancers bring and enhance to this already set work? I love having the opportunities to bring pieces back and witness how they come alive in a new way! So we ARE back! Check in often as eee dancers, guest writers, and I will be creating blogs about our experiences throughout the season! First, a huge thank you to all who came and auditioned with us. We had a great day dancing and sharing our work with you! Second, EEE needs your help. We have put together a short survey to help us gather information on Winter! We are looking to remount our collaborative production with MadMunchkin Productions Snowbound: A Journey from Fall to Spring at the Lab theater in March 2016. The survey asks questions all about the season of winter and will work as a guide to help us expand on the thoughts, emotions, and experiences of winter. Please help us by taking this short survey and come support us by attending this season's performance! Thank you! Audition For EEE's 2015-2016 Season! Eclectic Edge Ensemble (EEE) is seeking male & female company members and apprentices for its 13th season. EEE is a contemporary jazz dance company with a diverse repertoire, collaborating with local musicians, choreographers, and other artists to create musically and theatrically inspired work. This season, EEE will be producing two shows: Snowbound, a collaboration with Mad Munchkin Productions, will be held at the Lab Theater in March 2016 and news about our July 2016 show will be coming soon! Other performance and teaching opportunities may arise throughout the year. Performance stipends will be provided. Dancers must have a strong technical foundation in jazz, ballet and modern. Auditions will include a warm-up, combinations at center and across the floor as well as company repertoire. EEE offers the "Steal of the Summer!" Ready for the exciting news... in 3...2...1! Eclectic Edge Ensemble is thrilled to announce the "Steal of the Summer" offering tickets to our event at a new discounted price!! -Tickets will now be offered at $20 ages 18 & up, which includes two tap beers or root-beers and a ticket for our grand prize drawing to be handed out at the event! $15 ages 17 & under, kids 5 & under FREE! -We will also be keeping our menu fun and festive offering refreshments, summer appetizers, and deserts! Make your reservation today by emailing eeedance@gmail.com! We hope to see you all there! EEE's Summer Social, Drink and Eat to Support our Dancing Feet! You are invited to embrace summertime with Eclectic Edge Ensemble! Join us for live music, outdoor games, exciting silent auction items, and delicious food and drink. Every age is welcome! All proceeds are in support of EEE!. We hope to see you at our Summer Social! How: Now taking ticket reservations! email eeedance@gmail.com to make your reservation today! $25 ages 18 & up, $18 ages 17 & under, kids 5 & under FREE! Included in the cost of your ticket is a meal, featuring pulled pork sandwiches, summer salads, desert, and two tap beers! (or Rootbeers). We will also have live music, outdoor games, and silent auction items with all the proceeds from the event going to support EEE's upcoming dance season! EEE's Flip Your Refund 2015! Eclectic Edge Ensemble’s Flip Your Refund 2015! Eclectic Edge Ensemble is seeking donations for our upcoming season! Did you have many tax deductions for 2014? Are you looking to expand on tax deductible organizations? Why not get a head start on your charitable donation season and Flip your Refund by making a contribution to Eclectic Edge Ensemble! Help us achieve our goal of $2500 by donating today! Had the pleasure of working with more than 60 amazing dancers over the years! We recently closed on our first production of our 2014-15 season “EEE-Twelve” and received positive feedback from our audiences! We now shift our focus to our next show “Lost Voices in Jazz -The Choreographers of the Minnesota Jazz Dance Company,” A project to restage works by four choreographers lost to AIDS; William Harren, Jeffrey Mildenstein, Clarence Teeters Jr and David Voss. The O'Shaughnessy, in St Paul, Minnesota, July 24-25 @ 7:30pm. Also featured, a solo choreographed and performed by jazz master, Danny Buraczeski and "At the End of the Day", the newest work by our own jazz legend, Zoe Sealy. We are in partnership with Open Arms MN, making efforts to improve HIV/AIDS awareness and in increasing support for those living with HIV/AIDS. Megan Mohr and Artistic Director Karis Sloss rehearse for a new piece to premiere at the Lab Theater! From all of us at EEE! Eclectic Edge Ensemble would like to send our sincerest wishes to you all this Holiday Season and best wishes as we celebrate a New Year! Looking ahead to the new year we hope you will mark your calendars for the first of our 2015 season EEE-12 happening at the Lab Theater February 12-15th. Stay connected with us for more details about this upcoming show by followings us on Instagram, Twitter, like our Facebook page, visit our webpage www.eclecticedgeensemble.com, and encourage those to join our mailing list to stay updated! From all of us at EEE, Happy Holidays! We premiered a section of A Woman’s Choice at our winter 2008 production “Shelter from the Storm.” This was the first production that EEE took a theme and then created short vignettes and movements with a satirical edge. We had a great time working on this production and finding out amongst ourselves the challenges, glories, stereotypes and laughter we all ensue as women. This show was created sitting in the Barker’s #200 waiting for our turn to take the stage in Jazz Here Jazz Now, when the incomparable Kaleena Miller and I vowed to create a show together. What an awesome idea this was in bringing so many talented artists together. EEE took the first half of the show and created Sirocco; a tale of a deadly storm that comes into a town and sweeps away at its core. The incredible score was created by Richard Sloss, Warren Park and Bobb Fantauzzo. This was also EEE’s Megan Mohr and Desiree Dantona’s first production with the company. We also had a beautiful guest performance by Andrew Lester. We are less than a month away from our 10th Anniversary show! As we approach this milestone, we cannot help but look back on the amazing people that have contributed to this company. Over the next few weeks, we would like to highlight some of the dancers and artists that have contributed and continue to give so much to EEE. Thank you. Heather Annis graduated from the University of MN with a BFA in dance and had the privilege to perform works by Louis Falco, Linda Talcott-Lee, and Paula Mann. She currently teaches dance and assists with administrative work at Ballare Teatro Performing Arts Center. Heather has been dancing with EEE since 2008 and has loved every minute! She would like to thank her wonderful husband, family, friends, and cat for all their love and support. Allison Doughty Marquesen is proud to be in her 7th season with EEE! She holds a BFA in Dance from the U of MN, and will graduate with a masters in Holistic Health Studies from St. Catherine Univ. in Dec. 2013. Allison also dances with St. Paul City Ballet, where she was the co-artistic director for the 2012-13 season. When not dancing, Allison focuses her energies on her recently established holistic health coaching practice, practicing and teaching yoga, and most importantly, relishing in time with her beloved family and friends. This was a huge performance for Eclectic Edge Ensemble in so many countless ways. First off my father, Richard Sloss, and I took a workshop at the Hennepin Arts Center bringing together composers and choreographers. It was such an inspiring workshop for me, and also brought me together with local MN composers Warren Park and Bobb Fantauzzo. Along with my father, they created all of the music for Music that Moves. The winter prior I was a guest choreographer for Zenon’s Scholarship Program where I created a piece that EEE would later perform entitled: “Waiting.” The best part of working with the Zenon Scholarship Program is that it brought Becky Olson and Katrina Archambault, who have been such positive, supportive and inspiring members to EEE. After finishing the piece at Zenon I held an audition for EEE where we brought such incredible dancers into the company including Allison Doughty, Erinn Liebhard and Nina Ebbighausen. These beautifully talented performers have helped mold EEE into the company it is today. I am so blessed to continue to work with you all. A couple of months after EEE performed Para Ti as part of Second Sight/First Viewing at the Illusion we rented Intermedia Arts and performed Ella Suena. Ella Suena brought back Fragile Dreams from the MN Fringe Festival, Para Ti and a new piece called The Words We Know…The Words We Know was the first time I was honored to collaborate with a local composer/musician; Hattie.